Jesse P. Sanford was born in Redding on August 7, 1902. He and his wife Helen had three children, seven grandchildren and twelve great-grandchildren. They lived on Black Rock Turnpike, just south of the flagpole at the intersection of Cross Highway. It was at this intersection where Jesse would be seen raising and lowering the American flag every day. Jesse was arguably the most influential Redding resident of the twentieth century. 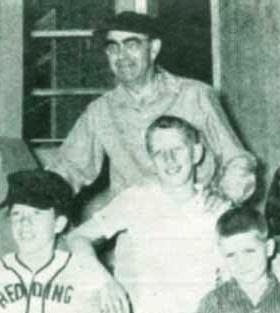 He founded the Redding Boys Club (predecessor to the Boys & Girls Club of Redding – Easton) in 1939 for the purpose of providing safe, supervised recreation for the children of Redding. Jesse also served as Judge, First Selectman from 1969 - 1977, Town Treasurer for four years and was on various Boards and Commissions. Jesse’s service to the community earned him the designation of Redding’s “number one volunteer” in 1991. Jesse was the face of the club for over half a century. He served as Executive Director and was involved in every aspect of the club’s operations until he died in 1996 at the age of 93. He was a fixture at the club every night during the spring and, when not taking in a few innings of a ballgame, could be seen doing any number of chores around the club’s property. From collecting soda cans for the five cents reimbursement to reconciling cash receipts from the “snack bar”, there was nothing beneath Jesse. Today, the Jesse P. Sanford Boys & Girls Club of Redding-Easton is an integral part of the community. It provides the youth of Redding and Easton a multitude of sports and developmental programs that enhance their sense of community while building character, leadership, health and life skills. Nobody exemplified these traits more than Jesse.